Transkei, Wild Coast, Pondoland, what does the mind’s eye conjure up when it hears these words? Massive cliffs, rough seas, friendly locals, and pristine beaches, or possibly ocean-going cows, colourful rondavels pock marking the landscape or children screaming “SWEATIE, SWEATIE!”? 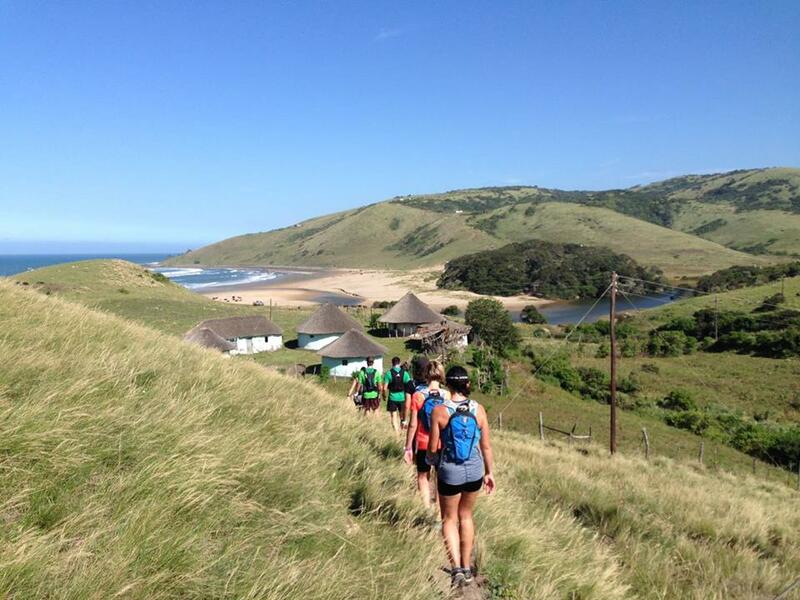 Yes, the Transkei is undeniably and incredibly unique for a number of reasons and by default, any trail-running event along this utopian single-track destination is instantly embalmed in grandeur by the holy grail of travel destinations. The Pondo Drifter trail run, now in its fourth year, is one such trail run. Taking place north of Port St Johns it follows a hopscotch route using the famous Drifters hiking camps as its daily start and finish points. Now anyone who knows anything about Drifters will know it is a quality offering with food, accommodation and unique locations the pillars of its luxury service offering. Add to that the precision hosting and friendly infused organisation of team TriSport SA and you have a winning combination. Meeting at Cremorne River Lodge in Port St Johns runners are taxied to the start through local villages and shown a massive Cape vulture colony, off the beaten track. The route for the trail run starts at Msikaba camp, where prior to starting, runners can enjoy the local beaches and kayaking up the river. The tented camps are a bit of a misnomer as the luxury tents are permanent structures including external roofs, bathrooms and beds with linen. A dining area overlooking the ocean, local river or pristine indigenous forest is guaranteed and local staff service your every need. This is service Transkei style! Day one of the event takes runners from Msikaba camp 18 km south to Luputhana camp. A relatively flat section along the coast with single track and beach sections taking them past the famed Grosvenor shipwreck location. Reputed to have gone down in 1782 with a bounty of gold, diamonds and rubies, it has seen a number of salvage attempts from land, including tunnels and winches still visible from land, none of which have been successful! Arriving at Luputhana camp, runners have the opportunity to experience one of nature’s true revelations of waves doing a staccato dance as they smash against the rocky coastline. After a relatively easy first day, the second day covers 26 km from Luputhana to Manteku tented camp. This is undoubtedly the highlight of the 3 days, taking runners along unpopulated pristine coastline including two of only seven waterfalls in the world that plummet into the ocean, and ends with a kayak taxi to your camp for the night. The day’s journey will leave you grinning as you lie in your luxurious accommodation with the moon rising and the sound of local wildlife keeping you intrigued. The final day traverse of 27 km leads you to Cremorne River Lodge on the banks of the mighty Mzimvubu River at Port St Johns. Expect long white beaches, steep cliffs, scrambles, and deep caves inhabited by descendants of our ancestors on this final leg of the adventure. The route also includes some jeep track through local communities who are always happy to engage in friendly banter and encouragement. Notice none of the above alludes to a stage race, times or racing. Another unique thing about the Pondo Drifter trail run is its non-competitive, social, come-and-enjoy type atmosphere. Start times are decided daily, based on tides and generally, it is about enjoying the unique terrain and fellow runners from across the globe. Due to this outlook, a local guide is provided to ensure you don’t miss out on any of the local site-seeing attractions. However, if, like this year, you are using it for a training run of sorts you won’t be held back as the TriSport organisers happily accommodated everyone. At the end of the day it is a wild and crazy place, but so too is the thought of covering 70 km over this terrain in three days. Or is it? Due to accommodation constraints numbers are limited to 20. Entries for 2018’s event open on 1 June, so make sure to visit the TriSport website to book your spot.